A Funny Thing Happened On The Way To VFX. It all started in 1982 with a sketch in the corner of the Social Studies notebook (I probably was not paying attention anyway). Originally an alien life form, not quite sure from where, but cute. 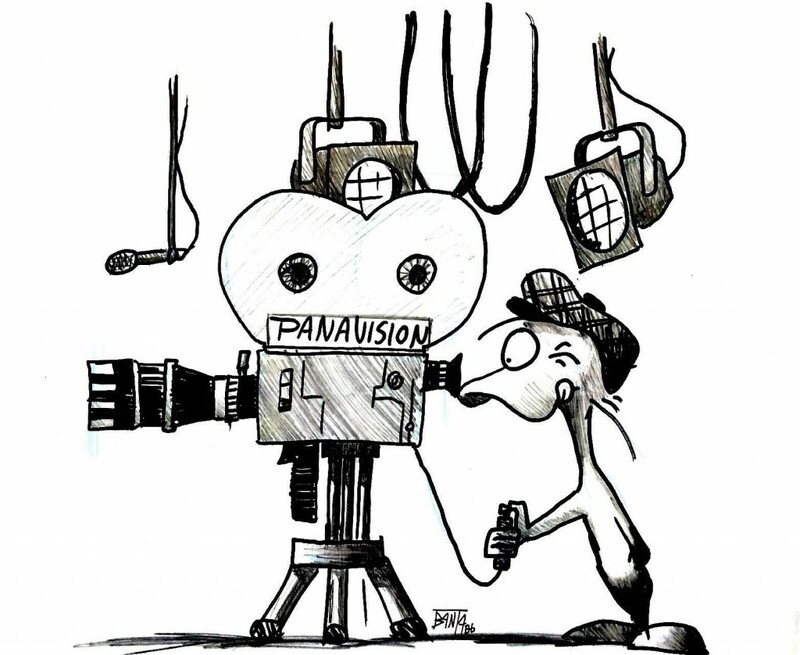 I’d already spent several years drawing Danger Duck and Quacker — obvious Donald Duck rip-offs — but making cartoons seemed to be a direct extent of my obsession with VFX and animation, as well as a great skill to cultivate for storyboarding. Eventually it all landed me a comic strip in the school newspaper. I called it “Harv’s World,” though I had no idea who Harv was. As it went into the local newspaper, the characters were still fairly crude. A 1986 hot glue sculpt refined the forms. With no character in hand, and my first HW strip published starring “Drek” (a tennis shoe wearing cross between Groucho Marx and a stick), I needed to get creative. Looking through my notebooks revealed an original sketch of an alien, which I spent two days teaching myself to recreate. I realized that eventually I had to design what it looked like from the side, so I changed the strange W-shaped line under his eyes into half a duck bill — Harv was born. Harv continued to evolve as my skills did, but did not take final shape until I molded him in Hot Glue from a clay sculpture, and painted clothing on him four years later. Harv’s World ran in the High School Paper for two years before moving to the local town paper (I was not paid for it), and eventually became the first student run comic strip at my college. With every re-emergence of the comic there would always be people I knew, or who those who I did not that had aspirations of being comic artists, seeing my strip and quickly pushing out their own comics. It is nice to be a catalyst for new things. The original strips were inspired by Charles Shultz Peanuts and Johnny Harts B.C. — and were very derivative of those properties, and the writing staff of the Boys Life magazine joke page. After gaining a significant comic education reading Bloom County, and Calvin and Hobbes, Harv and team entered the college world in a college newspaper. He is always in the margins of my sketchbooks, on the occasional post-it, and out the corner of my mind. Every now and then he arrives on the web. People keep calling him a duck because he has a bill. He isn’t. I assure not even he knows what he is, except anything more than just a dumpy little Harv. No “duck” labels here, we define ourselves by our comic panels … take it up with him. Decades of doodling have improved the character significantly, so expect to see Harv on these pages more and more, as I push my imagination out of the day-to-day grind of visual effects, and into little observations of life. 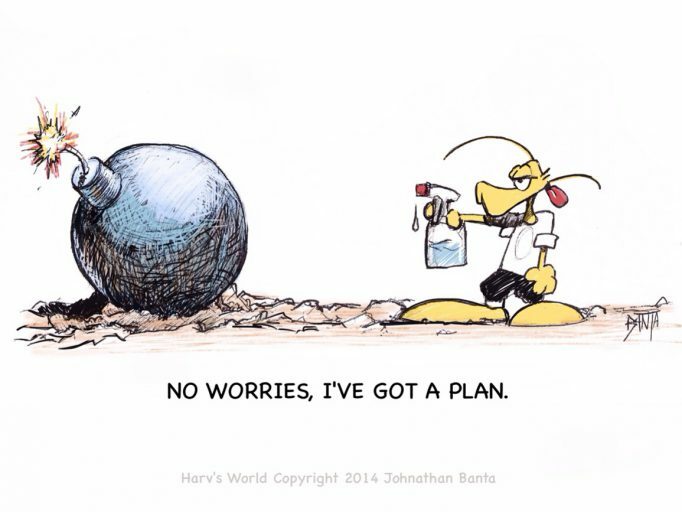 Until then, please enjoy the archival Harv’s World page from the 1990’s, what new cartoons that will start to show up here, or the #SundayFunnies posts on twitter. There is now a Harv’s world pull down menu and gallery for the category. #HarvsWorld on Google+, LinkedIn, and Twitter.